A keen focus on safety, reliability and performance is applied to all our system designs at Morrison Company. Our strategic partnerships with trusted, major material handling product manufacturers ensures you get the best design, engineering and product mix available for your unique needs. From aircraft to the automotive industry, construction to maintenance, Demag offers a complete range of cranes, hoists, drives and handling technology for every application. 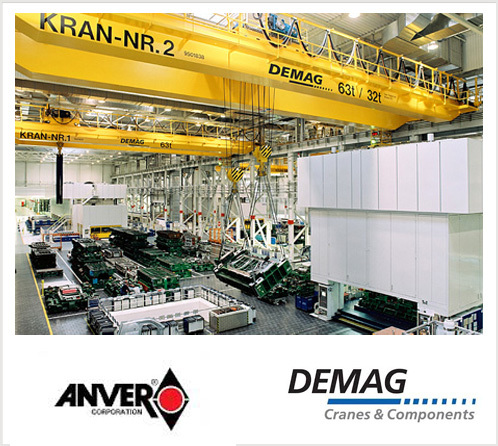 Demag offers KBK Modular Crane Systems, a full line of standard components which can be configured to create a custom system to meet your lifting needs. KBK modular elements can be combined to create individual suspension monorail, suspension crane, pillar and wall-mounted slewing jib crane solutions with load capacities of over 7,000 lbs. In addition, Morrison offers Anver Vacuum Lift products to save time and increase both safety and productivity. This line of products includes self-powered mechanical vacuum lifters, modular powered vacuum lifters, and self-powered tilters, light duty to heavy duty lifters, side-grip and more. Morrison Company will help you navigate the choices and select the best options for your business.